Spectacled bears Lucho and Sabina are safe in the Peruvian forest, next door to the magical Cholita, having successfully been removed from the illegal zoo that held them for years after they were taken from a circus and a wildlife trafficker. 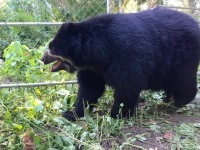 Help us care for our three bears! The rescue operation in Sandia, a remote Peruvian town in the Andes just north of Lake Titicaca on the border with Bolivia, began at 3am. Previous attempts to remove them from this zoo had been thwarted; we were warned to expect opposition. Many locals wanted to see the bears move to a better place, others wanted them to stay. Fearing trouble, officials ensured we had armed police for the seizure and for the first hours of the journey. In the event, the seizure ran smoothly. 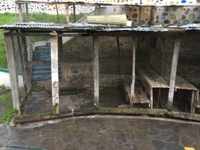 We removed every animal from the zoo – bears Lucho and Sabina, plus a fox, kinkajou, four parrots, condor and two tortoises! We then embarked on a gruelling two-day journey over the Andes, hitting heights of 5,000 metres, before heading along up the Madre de Dios River, to the ADI bear habitats at Taricaya Reserva Ecologica. Lucho and Sabina have moved in next door to Cholita, who was definitely intrigued to see her own kind for the first time in 20 years! Watching from a safe distance as they were unloaded and then venturing to get a closer look at Sabina, Cholita then headed back into her own piece of forest. Only time will tell whether they will become friends. Funding for the operation was raised after British actress Joanna Lumley launched an emergency appeal. 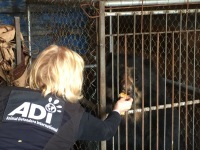 The bears’ first day in their new home was also the 92nd birthday of the legendary and award-winning TV host Bob Barker, who has been a major backer of Operation Spirit of Freedom and previously enabled ADI to empty every circus of animals in Bolivia.